There was no shortage of good will in the room at Cynopsis’ third annual Social Good Awards, March 2 in New York. Campaigns ranging from environmental initiatives, to empowering voters, to combating addiction were spotlighted, to an appreciative, and packed house including television and media execs and decision-makers from brands including American Express, AT&T, Nestle, Subaru, Toyota and Upworthy, whos co-founder Peter Koechley was a guest presenter. In addition, Cynopsis premiered the inaugural Impact Award at this year’s breakfast celebration. 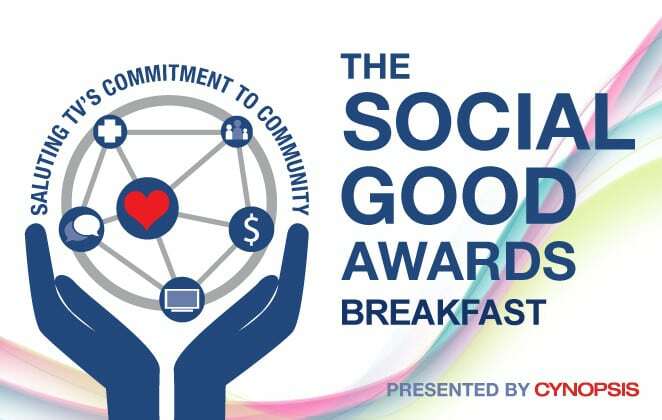 As its name suggests, this esteemed recognition is awarded to a company, network, campaign and/or person who generates exceptional prosocial impact. In a presentation delivered by Katie Couric, journalist, author and creator of the new film Gender Revolution: A Journey, National Geographic picked up the Impact Award in the Network category for its commitment to programming that engages viewers in stories about the human condition and exploration of new frontiers. Courteney Monroe, CEO of National Geographic Global Networks, was on hand to accept. Viacom’s Listen Campaign, created to break down the stigma of addiction, promote resources to help the 21 million Americans struggling with substance use, picked up the Impact Award in the Campaign category. Viacom EVP/CCO Niels Schuurmans and actress Debi Mazar, star of TV Lands Younger, took the stage to talk about the importance of the campaign to the Viacom family. In the Brand category, Cynopsis recognized Impact Award honoree Dove for its continued role in elevating the conversation around the concept of beauty through a variety of cross-platform media campaigns. Dove Brand manager Lisha Perez shared the evolution of the Real Beauty campaign with our audience. In addition, the SGA Legacy Award was presented to John Walsh, Founder of the National Center for Missing & Exploited Children (NCMEC) and best known for his role on the television show America’s Most Wanted. The award was introduced by Justice Network CEO Steve Schiffman and accepted by Walsh’s son Callahan. Cynopsis is extremely proud to salute those in the industry raising awareness and inspiring action. We look forward to seeing everyone’s 2017 entries this December and celebrating in the spring of 2018! The dedicated social impact unit of Fusion launched this journalism fellowship program that saw an initial group of 14 students engaged in a two-month training program in journalism. Their stories and videos have reached an audience of more than 6 million people. Blue 449 partnered with GLSEN to develop a campaign to raise awareness about the negative influence of LGBT bullying and harassment. Blue 449 was able to secure approximately $800K in media value for the campaign. Azteca’s commitment to serve the community was reflected not only in their programming but also in the number of alliances formed with the various organization’s to create civic engagement campaigns promoting citizenship, voting rights awareness and guiding the community through the electoral process. This robust community initiative was aimed at empowering viewers to take action for a better life in areas of key importance to U.S. Hispanics: education health, finance and civic engagement. Arrowhead Spring Water’s “Naturally Different” campaign marketed its product via multiple Volta Electric Vehicle Charging Stations, which were positioned throughout the city of Los Angeles. Operation Prevention, started by the U.S. Drug Enforcement Administration and Discovery Education, focused on the dangers of opioid and heroin abuse. Since launch, program has reached 200,000+ students nationwide. Cartoon’s Stop Bullying Campaign has become as integral to the network as its kids programming. Chicago Bulls forward Jimmy Butler illustrates the importance and impact of mentorship in a widely-shared episode that has received more than 1 million views. “Crash The Parties,” launched by Fuse to help inspire and empower Latino youth participation in the 2016 Presidential Election, held a competition to find two young adult Latinos to become embedded reporters for Fuse. This past year, WWE and Susan G. Komen shifted their focus from generating awareness to inspiring action with the More Than Pink movement, celebrating the everyday heroes who have made a significant impact in the fight to end breast cancer. Nickelodeon’s Together For Good and UNICEF spot encouraged positive social values, challenging inequalities and giving voice to all children. The Red Bandanna Award was created to pay tribute to 9/11 hero Welles Crowther. 2016 was the second year of the contest, and there was a remarkable 1,198% increase in entries from the prior year. The FosterMore campaign helped spread awareness of the need for foster homes for orphaned children. Nearly 1.2 million residents of New York City and Los Angeles viewed the ads, generating more than 500 direct leads for area foster agencies. Logo’s digital docuseries “Fill in the Blank” highlighted LGBT diversity, gathering 100K streams/engagements across YouTube/social platforms. The objectives of the “Listen” program were to encourage dialogue to break down shame and stigma, drive awareness of resources, and celebrate the success found in recovery. BET Network’s Next Level education campaign partnered with Get Schooled to launch a program to connect high school students with Historically Black Colleges & Universities. Unity Weekend saw more than 300 employees volunteering with a variety of organizations; the Atlanta Hawks and Cleveland Cavaliers joining arms as a sign of solidarity; and a team float for the city’s Pride parade. The Before The Flood campaign was started by National Geographic to spread awareness of climate change through the film, Before The Flood. Coinciding with the global television premiere, the film was released commercial-free on a record number of digital/streaming platforms. Created to help drive viewership to National Geographic Channel’s airing of He Named Me Malala and raise awareness for the Malala Fund organization, this campaign executed big on social media, particularly Facebook. Let’s take a look. Through short and playful animated videos in both English and Spanish, WASTED explores the reasons behind the massive growth in garbage and consumption. The videos have garnered more than 2 million views across platforms. The “Vote Your Voice” campaign was aimed at increasing voter turnout among African Americans during the 2016 election year, urging viewers to share their voices via social media using the hashtag #VoteYourVoiceBET. Univision Communications Inc. launched the nonpartisan Vote For Your America campaign to help Latinos register and vote in November. The messaging was seen or heard more than 1 billion times. The television series The Inspectors helps raise awareness of individuals with mobility issues by depicting life as a United States Postal Inspector and life seen through the eyes of a young man living with paralysis. Univision produced a 1-hour documentary on the subject of juvenile justice and built a coalition of 20+ diverse organizations – grassroots, academic, and private sector. Helping Neighbors continues to be a perfect example of how partnering in times when disaster relief is needed can amplify the help victims receive. The Call of Duty Endowment helps veterans find employment. With The Race to Prestige, the charity was able to raise $452K for the Endowment. Blue Chalk Media created a high quality short film about the work of SEE International, which provides aid to those affected by sight loss. Posted on The National Geographic Facebook Page, it was shared 2,185 times and received more than 15,000 reactions. Logo’s Trailblazer Honors, the largest televised LGBT Pride event, also served as a memorial to the 49 lives lost in the Pulse Nightclub attack in Orlando, and was up 89 percent in viewership versus the year prior. The TeenDrive365 Video Challenge encouraged students in grades 9-12 to create original videos describing what they could do in their communities to inspire their peers to become safer drivers. Nickelodeon’s Together For Good and UNICEF tackled complicated issues in a fun and engaging way that children could relate to. The program aired in more than 150 countries and was translated into 13 languages. Spanish-language network HITN-TV launched a campaign to help teach viewers about the American electoral process. The initiative included a series of segments that aired on TV and online. We Are The Mighty is a media brand for the 133 million “mega-niche” community of America’s military, veterans and their families. WATM’s veteran creators capture this community’s voice with original, multi-platform media, branded campaigns and high-profile events that are committed to making a positive impact in the community.